As I pull into the car park, the temperature gauge on the dashboard says 0.5°. It?s going to be a cold ride. 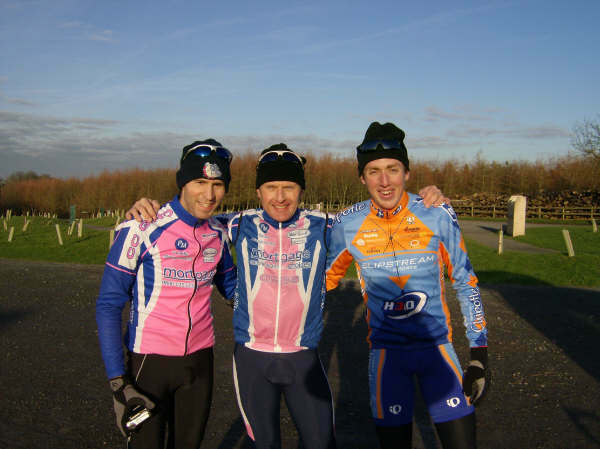 I?m at Rosliston Forestry Centre, a few miles from Burton-on-Trent, to meet Dan Martin and his CC Giro club-mates. ?It?s a bit cold isn?t it,? he says. ?It was minus five when we rode out this morning.? There?s not an ounce of excess body fat on him. I?m at least padded with a nice insulating layer of natural cladding that no high-tech breathable fabric can match. Martin is with his CC Giro club-mates for a midweek club run in the Derbyshire countryside. He?s wearing his new Slipstream kit for the first time. Argyle isn?t everyone?s cup of tea but the new colours look great. It?s less garish than the previous design, a nice mix of a rich blue and orange, with a bold pattern that wouldn?t look out of place on a golf course. It even stands out amid the 60 pink and blue CC Giro jerseys ? itself one of the most striking club jerseys in the country. The club?s name and jersey, are an homage to the Giro d?Italia. This ride has drawn a big turn-out. Three laps of a 20-mile loop on wide but quiet country roads make it ideal for group riding, while also giving the option to ride just one or two laps. As we roll out I rue the fact I know I?ve left my overshoes 120 miles away on the dining table at home. The first lap is spent engaged in very pleasant conversation with a couple of the club members until we pass a tractor trimming the hedge and strewing thorny off-cuts all over the road. As we round the bend, the grassy verge is dotted with shivering pink figures replacing their inner tubes. I thought I?d got away with it until I get that tell-tale thumping sound and sudden hard, unforgiving feeling through the rim of the back wheel. The tyre is flat. The group rolls on but, with other riders behind, I can mend the tyre and slot back in without a problem. I pull a huge thorn from the tyre and curse the hedge-trimmers. What?s the point of the big barrow designed to collect the cuttings if half the hedge ends up on the road? As I get rolling again, disaster strikes. The front wheel is also flat. By now I?m becoming a little concerned that I am in the Derbyshire countryside without a map and I haven?t seen any pink jerseys for a good few minutes. My second and final tube is used, another over-sized thorn is pulled out of the tyre. In my haste to inflate the tyre, my cold hands slip, the mini pump jolts and the wheel moves. Carelessly I have bent the valve and it?ll no longer pump up. The tyre is still very soft. It?s just not my day. Fortunately a CC Giro rider with a well-packed pannier comes to my rescue, offering another spare tube. Having spent the first lap at the back of the group deep in conversation I have singularly failed to take in anything about my surroundings other than the fact that we turned left, left and left again. Not confident enough to retrace my tracks and ride back towards the oncoming group of CC Giro riders I elect to ride up and down a mile-long stretch of road for 20 minutes or so to keep warm. Soon I see the orange and blue jersey of Dan Martin on the front of the group. ?I wondered where you got to,? he shouts. Dan Martin is not the first rider from CC Giro?s ranks to turn professional. Jeremy Hunt raced for the club in the early 1990s before heading to France. Dan?s father Neil ? a former Lincoln Grand Prix and Milk Race stage winner ? is another club stalwart. One of the oldest members, John Perks, also won the Lincoln ? twice, in 1960 and 1961. Now in his late seventies he?s riding regularly and he sits comfortably in the middle of the group a few wheels ahead of me. The club?s women are also famous in their own right ? you may remember last year they did a Calendar Girls-style photoshoot to raise money for a breast cancer charity and the Dave Rayner Fund. I?ve lost a lap but I?m just grateful to be riding at a decent pace again to get the blood circulating, even if my feet are beyond help now. It feels as if two blocks of Wall?s Viennetta ice cream have replaced my feet. Dan slips back down the line and we ride the last 15 or so miles side by side. Martin has secured his first professional contract at the age 21, and he?s recently returned from his first engagement with the American Slipstream team, a training camp in Colorado. A waif-like climber he attracted Jonathan Vaughters? attention a couple of years ago with some excellent amateur results for his Marseille-based club VC La Pomme. Vaughters wasn?t the only one who took notice but when the American set out his vision for the team, Martin was quickly convinced. ?I think in a year?s time everyone will want to sign for this team,? he says. Martin?s cycling background is rich. His father Neil raced professionally in Britain. His mother, Maria, is Stephen Roche?s sister. So what did his uncle make of his decision. ?He said pretty much what everyone else first said when they heard. ?What do you want to sign with them for?? ?I had to keep it quiet just how big the team was going and who they were signing.? Although born in Britain, Martin declared his allegiance to Ireland because of his frustration with the emphasis on track racing in the British Cycling set-up. He felt he would never make any headway or get to ride the World Championships for Britain. ?If you didn?t ride track they weren?t interested. I understand why it has to be that way but they?re not going to make really top stage race riders that way. ?That system doesn?t suit a rider like me. I remember seeing Swifty [Ben Swift] and Jonny Bellis a few years ago and they were a lot better climbers than they are now because they?ve gone down the track route.? Now he?s Irish, although he admits it left some in the Slipstream camp perplexed when they heard his gentle Birmingham accent. ?They can?t work it out,? he says. Colorado was an enjoyable experience, he says. Typically for an American team with a strong corporate identity the level of organisation was impressive. ?We had to sign a disclaimer form for just about everything we did,? he jokes. Wine-tasting and rock climbing were part of the activities on a trip which was designed to build team spirit without going down the CSC route of white water rafting and potholing. ?It was a lot of fun but very relaxed. I know when I go to New Mexico in January it?s going to be a lot harder. Everyone is going to be fired up to show what they can do.? One person he didn?t see a lot of was Vaughters. ?He?s a very busy man but I had breakfast with him on the last morning and we had a chat. He?s pretty laid back but I think that?s because he?s so organised and he knows exactly what he?s doing.? The team?s anti-doping philosophy is thorough. There?s the contract for independent physiological profiling and testing by the Agency for Cycling Ethics and even a pre-loaded BlackBerry mobile phone for each rider to make updating their whereabouts information with the UCI easier. With so much cycling experience in his family tree, is he tempted to tap his dad, uncle of cousin Nicholas Roche, for information? ?Not really. I think you learn a lot more if you make your own mistakes, within reason. In races I want to see what I can do this year and find out for myself what works and what doesn?t. ?Of course I listen to advice but too much from too many people can be unhelpful. The thing with my dad is he knows exactly what it?s like. Some parents, those who haven?t raced, might say ?Why did you get dropped there?? Dad knows because he?s done it. He knows I?m giving it everything. I also know that if I need anything I can ask him. ?At the moment though it?s about keeping it fun. Getting out on the club runs like this is great because it?s such a nice group of people. It?s strange. A lot of these people have known me since I was 13 or 14 and now I?ve turned pro to see them so proud of me is really nice. To some of them, though, I?m still just the kid who turned up with his dad one day.? Every new professional relishes that first step into the unknown with a mixture of controlled fear and anticipation. Martin?s first professional race is scheduled to be the Tour of the Mediterranean in mid-February ? virtually a home fixture. ?It?s a nice race. I know the organisers and a lot of people from the club [VC La Pomme] are involved in it. I?ll know all the roads because I?ve trained on them and the stage to Mont Faron [the hill that juts above Toulon] will be the one I?m most looking forward to.? As a climber, Martin thinks he may get to experience quite a few big races in his first year. ?I don?t want to overdo it but I?d like to do something like Tour of Catalonia or the Dauphiné. I think it?s important to get a look at those races as early as possible.? Given Slipstream’s roster, it’s possible that Martin will be exposed to some tough racing in his first year as a professional, but he’s not daunted, far from it. Back at the forestry centre there?s the sort of buffet that widens the eyes of a cold cyclist who?s spent three hours in freezing conditions. Fat slices of turkey and ham, sausage rolls and salad, followed by mince pies and Christmas cake. True to form, the cyclists descend like a plague of locasts. After that there?s the annual welly-wanging competition, won with an almighty throw that might have caught the interest of the dope testers, and rewarded with a trophy that looks very much like a child?s pink Wellington boot on a wooden plinth ? largely because that?s exactly what it was. Martin doesn?t over-extend himself but posts a respectable throw. It was just a surprise one of Slipstream?s legal team didn?t emerge from the bushes with a disclaimer form.